Homer Simpson Etch A Sketch | OhGizmo! With the flood of new Simpsons-related merchandise that came out with The Simpsons Movie last summer, it’s not surprising that a few items may have gone unnoticed. 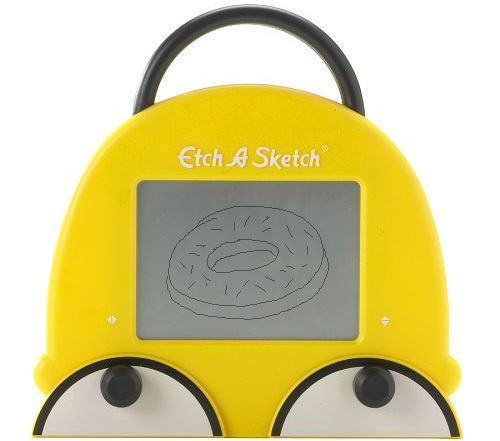 But with the Etch A Sketch recently popping up again in the gadget world, I can’t believe I haven’t come across this Homer Simpson themed version of the classic Etch A Sketch before. Instead of using white knobs to create your aliased masterpieces, you actually turn Homer’s pupils which is kind of creepy. On the other hand, Homer’s combover makes for a great carrying handle and a convenient way to hang this on your cubicle wall. You can find it at Perpetual Kid for $14.99. Is this some kind of fancy digital etch-a-sketch, or is there some magical technique to make lines separate from all others that I’m not aware of?